A substantial detached period manor house for sale near Cernache do Bonjardim in central Portugal. The manor house, which has decorative stone window and door surrounds, measures 400 square metres of construction and has land measuring 1,600 square metres. The manor house is set over two floors and is connected to mains water and electricity and also has a well on the property. The property retains many original features including wrought iron ‘Juliet’ balconies, internal wood shutters and wooden floors. The manor house was constructed in 1749 and has many original features including wooden framed, decorative windows. There are some internal wooden shutters as well as traditional style painted tiles to some of the hallway walls. Ground Floor: The ground floor of the manor house has been divided into a several divisions and has traditionally been used for storage purposes. There are several entrances to the ground floor, one of which is a traditional style, double opening decorative wooden door. One of these rooms on the ground floor was used as an adega (wine making). First Floor: The living accommodation of the manor house is situated on the first floor and is accessed via a carved stone staircase. The manor house has five bedrooms, all of which have wooden floors and ceilings and internal wooden shutters. There are two bathrooms, both of which are partially tiled. There is a spacious living room which has a polished wooden floor and decorative wooden ceiling. The kitchen is partially tiled and has an exterior access door which leads out to a large terrace at the side of the house. This terrace runs the depth of the house and has stone paving as well as an exterior staircase leading to the garden at the rear of the house. All of these rooms are accessed off a central hallway, which has a wooden floor and ceiling. Attic: The property also has a large attic, which is accessed via a wooden staircase. The attic has a wooden floor and has been used for storage purposes. The property has a garden measuring 1,600 square metres and there a are variety of mature grape vines and fruit trees. The garden is wall and private and there is also a well with the original mechanical workings. 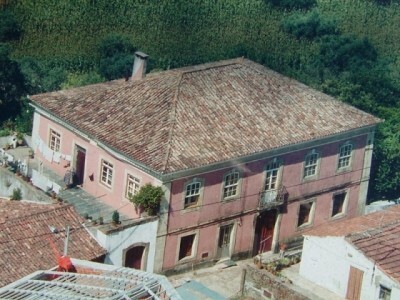 The property is situated in the small village of Paparia in central Portugal. The town of Cernache do Bonjardim, which has cafes, shops, pharmacy, banks, schools, mini-markets, builder merchants and health centres, is only around two kilometres from the property.